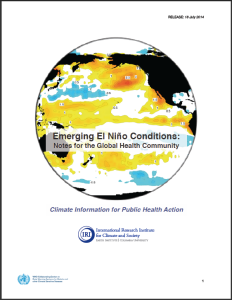 The IRI Health group has updated its bulletin, Emerging El Niño Conditions: Notes for the Global Health Community, to take into account the latest forecasts announced by the International Research Institute for Climate and Society yesterday. As with the previous bulletin, IRI lists several recommendations for improving risk management and disease surveillance in the face of changing climate conditions. Among them is the need for public health officials to partner with national meteorological agencies to improve their understanding of climate forecasts. Closely monitoring monthly changes to ENSO forecasts is also critical for emergency preparedness. IRI is a WHO/PAHO Collaborating Centre for Early Warning Systems for Malaria and Other Climate Sensitive Diseases.